In August, TCA President G. Lincoln McCurdy visited Australia upon the invitation of the Australian Turkish Advocacy Alliance (ATAA) based in Sydney. He held meetings with leaders and members of the Turkish Australian community and discussed Turkish political engagement. In both the United States and Australia, Turkish immigrants have successfully adapted to the respective societies but face similar challenges in the political arena. The Turkish American population in the United States is larger, approximately 500,000, compared to 160,000 Turks in Australia. However, Turkish Australians are far more engaged than the Turkish Americans in the political arena. Thanks to the vision and dedication of a small group of Turkish Australians, the Turkish community has managed to earn political clout in the Australian state of Victoria (Melbourne). They have shown that the promotion of political engagement is the key to gaining political influence. Three Turkish Australians are currently serving in the state parliament of Victoria, three in city councils of Melbourne and one in a city council of Sydney. In total, 13 Turkish Australians have served in local, state and federal elected office-twelve from the state of Victoria (Melbourne) and one from New South Wales (Sydney). Four Turkish Australians have served in the state parliament of Victoria, and one Turkish Australian representing Victoria has served in the federal parliament in Australia’s capital, Canberra. Eight Turkish Australians have been elected to city councils in Melbourne and Sydney. Except for one Liberal Party city council member in Melbourne, all the other Turkish Australians in elected office are members of the Australian Labor Party. 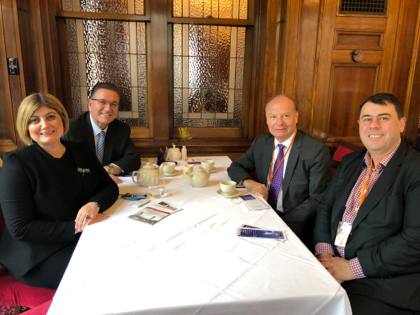 MP Natalie Suleyman and MP John Eren of the Legislative Assembly (lower chamber), Labor Party, in the Victoria State Parliament and ATAA representative in Melbourne Erhan Karabardak. Eren is the Victoria State Minister for Tourism & Major Events, Minister for Sport and Minister for Veterans. In comparison to Australia, there have been 11 elected officials of Turkish heritage in the United States, but only in local jurisdictions. Unlike Turkish Australians, no Turkish American has ever been elected to state or federal office. Turkish Americans are not affiliated with one party, and have run for public office as Democrats, Republicans and Independents. Currently, there are four Turkish Americans, three Republicans and one Democrat, serving in elected office on the local level. In order to enhance its political presence on the state and federal level, the Turkish American community should further the model of Victoria’s Turkish Australians.